CAMP RUPERTO KANGLEON, PALO, Leyte- A businesswoman was wounded after she was shot by a still unidentified assailant while she was on her to the municipal hall in Albuera, Leyte. The victim, Mercy Villar, 40 and a resident of Barangay Poblacion of said town, was hit at her stomach and was rushed to a hospital at the nearby Ormoc City. 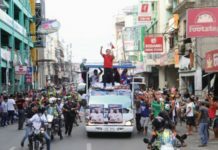 The incident took place at about 8:00 am Thursday (March 22) in front of the Albuera municipal hall. 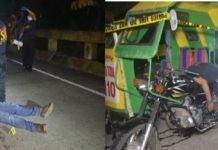 Based on the initial police report, the shooting incident was perpetrated by two suspects who were on board a motorcycle. One of the still unidentified suspects drew his gun and shot the victim, who had just alighted from her vehicle, hitting her at her stomach. The victim, said to operate a lending business and own a store at the town public market, was rushed to a hospital in Ormoc City where is recuperating from the bullet wound she sustained while the suspects fled after the incident. Elements of Albuera Municipal Police Station are conducting a follow-up investigation and hot pursuit operation for the arrest of the suspects. Police have yet to determine the motive on the shooting of the victim.